Yes, I have definitely slacked at working out. And by slacked I mean, I haven’t worked out in over a month! I am terrible! BUT. I thought I’d update this blog, dust the cobwebs off so to speak, and write a post about what I’ve been up to. Dave’s birthday is tomorrow (May 7th) so to celebrate we invited his family over to have milk and cookies. 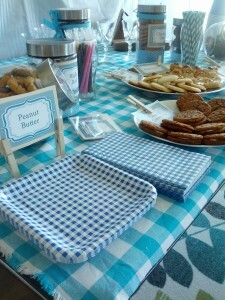 The idea for the party started back in January when I was heavy into reading craft blogs. 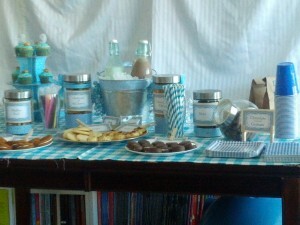 There was a fun post about having a milk and cookies party just for fun. I loved the idea. I asked Dave if for his birthday this year he would want a milk and cookies party. He laughed as it was January, a full 5 months away from his birthday. 2 weeks ago I asked again, I was being very persistent about this. I wanted an excuse to bake and buy cookie jars. This time he agreed and we got to planning. Normally I like to get way ahead of myself and buy things right off the bat but we took our time and drove around to stores we thought would have awesome stuff for the party. I also looked online for ideas and came up with tonnes. A lot of people have milk and cookie parties it turns out. 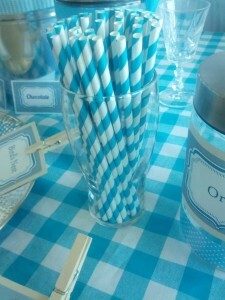 After taking pictures of all the things we thought we might want to buy for the party we spotted these straws. We both really liked them. They are paper and a really nice colour of blue. Because we hadn’t rushed to buy anything before we saw them we picked them up. They ultimately ended up deciding our colour theme for us. The straws and 2 milk bottles both came from Home Sense and were a steal at around 15 bucks total. It’s hard to see but the bottles look old-ish and they have imprints of cows on them. 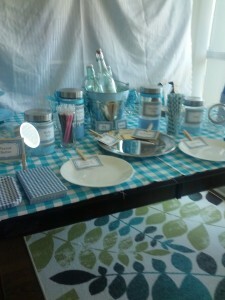 The jars all came from Dollarama. You can find a lot of great stuff in that place and with a little effort make them not look so plain. 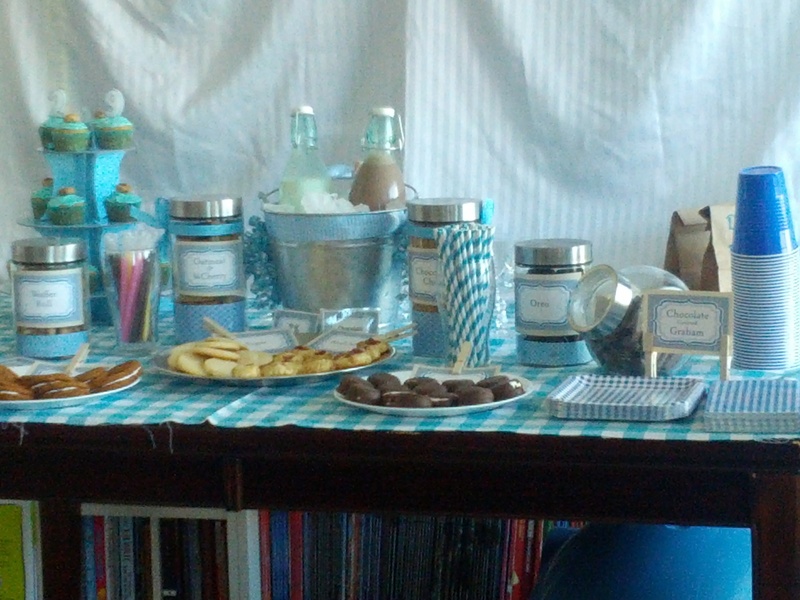 We bought 6 jars for around 10 bucks, and a silver platter we found on sale at Bouclair for $6. The can was supposed to be for gardening and was also found at Dollarama, it was $2. To jazz up the jars and bucket we bought some scrapbook paper at Michaels. I used a coupon because I will never buy anything at Michaels for full price. So that came to $4. After we had bought the set pieces we decided how many cookies and what kinds we wanted to make/buy. 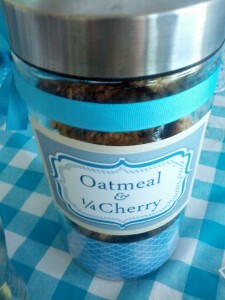 We ended up making 5 kinds of cookies: chocolate chip, oatmeal cherry, peanut butter chocolate, sugar and bird’s nest. We bought waffer rolls, oreos, chocolate covered graham, viva puffs and oatmeal cream. I also made cupcakes so Dave had something to blow candles out on. The cookies probably totalled about 30 bucks, ingredients included. The only thing we “splurged” on was the tablecloth. Which actually is just a 1 meter piece of fabric we found at Fabricland that was on sale. We looked all over for a tablecloth that would compliment our colour choice but ultimately decided it was easier to go to Fabricland and just pick something out of their gigantic selection. Even on sale it was $12, making it the most expensive thing we bought. The edges are frayed but we liked the look. It felt like we were at a picnic. The labels we made in photoshop, Dave is a whiz, I’m just learning. We laminated the ones that were going to touch the cold bucket all afternoon so the labels didnt run. It was a smart move. I’m actually sad I have to throw them all away, they were fun to make. We stuck them to the jars with double sided tape (Dollarama again! ), which worked out perfectly. 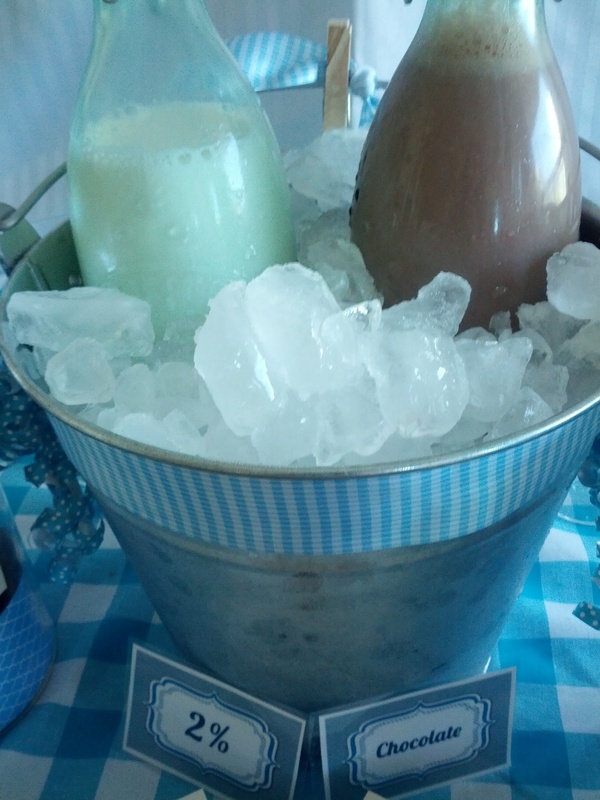 We tied some ribbon around a few of the jars just for extra blue. We baked Saturday morning. It took 4 hours to make 5 different kinds of cookies. The cupcakes I didn’t make until around 6 pm, I was just too tired from standing in the kitchen even with the mat my Mom bought me to stand on. 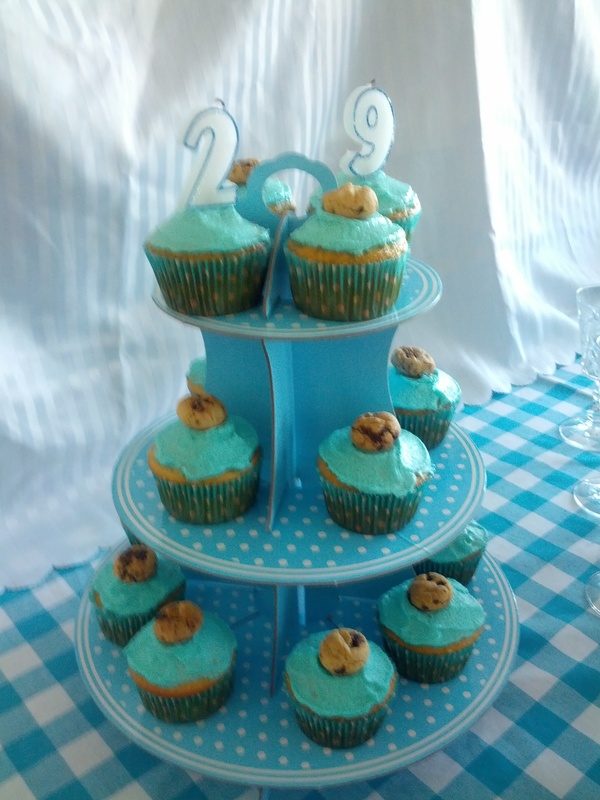 I dyed the cupcake icing blue, because if you’re going to go all in on something you might as well dye icing blue. I threw a mini chocolate chip cookie on top and got the matching cupcake wrappers at Bulk Barn for $3 bucks. The stand came from Dollarama, it was $2. All the cups, plates and napkins were bought at Dollarama for about $4. We tried to keep everything on budget, which was about $100. I think we probably came close but I haven’t added up the total. 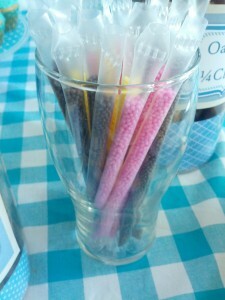 The only item that didn’t match our blue theme were these straws that changed the milk flavour when you used them. I like them a lot, I’ll probably buy more. Dave and I had a really great time putting the party together, and we’re definitely going to do other ones in the future. On a budget you can throw a really neat birthday, it turns out. I am starting to think my parents didn’t try nearly hard enough!